The object of proficiency training is to ascertain that an applicant for a new firearm licence has the basic knowledge of the stipulations of the Firearms Control Act (Act 60 of 2000 as amended) (FCA), and has the basic minimum of proficient knowledge to handle a specific firearm. 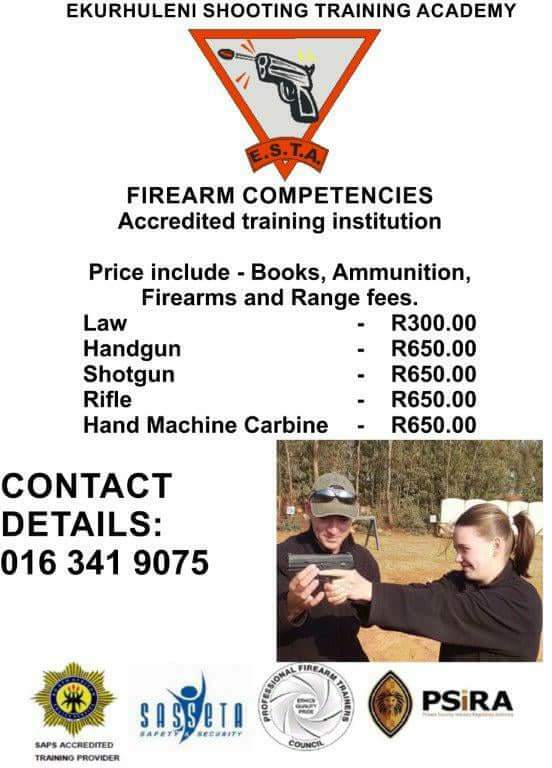 This training may only be provided by Accredited Training Providers who are accredited to the Professional Firearms Training Council (PFTC). For a list of such training providers in your geographical area you can CLICK HERE (scroll down the page and click on list of training providers). NHSA advises its members to complete at least the 5 more common unit standards, namely Knowledge of the Act (which is compulsory for all), Use of a Handgun, Use of a Rifle, Use of a Shotgun, and Use of a Self-loading Rifle or Carbine. Once you have completed these you will not need to do any further training in this regard re privately owned firearms – irrespective of what some training providers would want you to believe (once you have done this proficiancy training you do not have to re-do the training again. Do not lose the proficiency training certificates the training provider issues you with otherwise you will have to re-do the training to get new certificates if your original training provider has closed his doors. After having completed the training succesfully, make sure you receive the training certificates from the training provider - three days waiting period is more than enough - that is the training certificates of the Training Provider. Also make sure you receive the so-called Statement of Results underwritten by the PFTC (nothing else than a PFTC certificate stating that you had qulaified for these unit standards you had completed), which your accredited training provider must furnish you with (you pay for it as part of your course with the training provider). If you would want to own a black powder firearm you have to complete the unit standard for black powder firearms. No licence is needed to possess a black powder firearm but you must furnish a black powder competency certificate to the dealer before he may sell such a firearm to you. You will also not be able to apply for a permit to hold black powder, which is furnished by another section of the SAPS than the firearms section, without such a competency certificate. You can only apply for a black powder competency certificate after completing the specific unit standard with your PFTC accredited training provider. The training provider will after you have successfully completed the training (five unit standards mentioned above), send your results to PFTC (South African Professional Fierarm Trainers Council) for official recognition. The PFTC will furnish you with an official certificate which you must make sure to collect from your training provider as it forms part of the important documentation you have to have in order to possess firearms legally. This is like a matric certificate as it is a formal qualification acknowledged by SAQA and can never be made null and void – its your legal qualification (All POSLEC certificates and SASSETA certificates pre-2016 are still 100% valid - don`t allow people to tell you otherwise). Do not lose your PFTC Statement of Results the training provider issues you with otherwise you will have to re-do the whole training to get a new PFTC Statement of Results if your original PFTC accredited training provider has closed his doors. 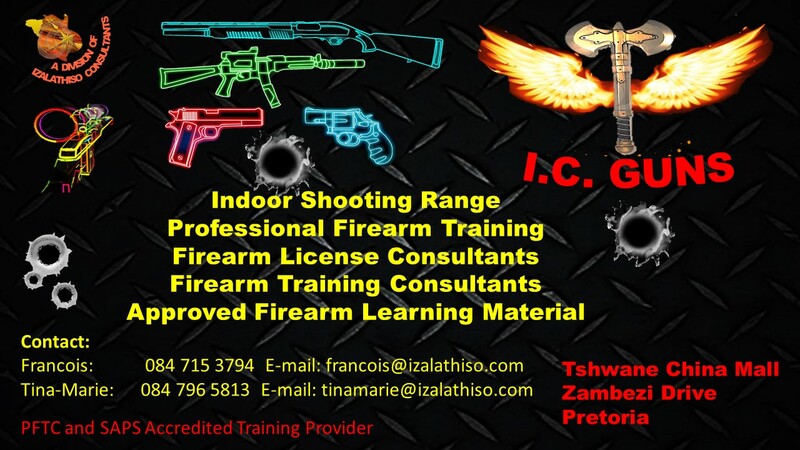 So make sure you get your training providers certificate when you complete your course – make sure you keep these in a safe place as they are important certificates pertaining to your legal possession of firearms. Please ascertain that the training provider you do your training with is accredited with PFTC – don’t fall into the trap of falsehoods of non-PFTC accredited training providers – unfortunately these fraudsters do exist.